Take a look at the chart to the right. It shows the number of school shootings in the U.S. by year (in blue), the number of dead (orange) and the number of wounded (grey). I just went to Wikipedia and tallied it up. I should say that I am not an expert on this at all. 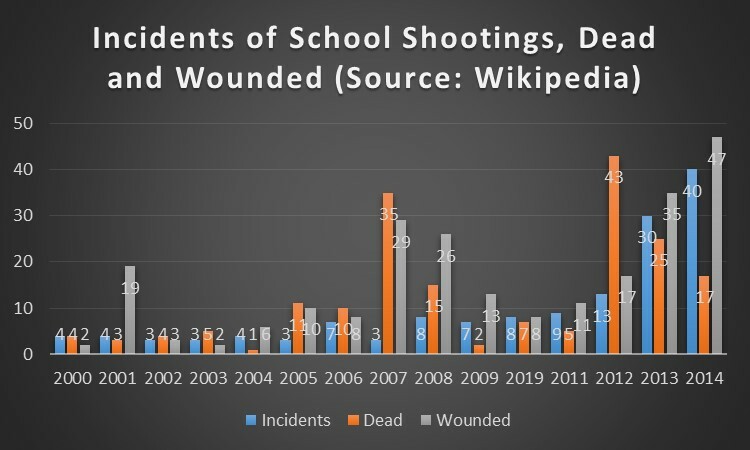 After a fairly steady rate between 2000 and 2007, the number of school shootings, and the number of victims is increasing rapidly in the last few years. The year 2014 is not half over, yet the number of incidents exceeds the number for the whole of last year. I could not readily find recent numbers for gun availability and the ease of getting legal and illegal guns, but we know that the number has been going up. The economy has rebounded and unemployment is down, and typically this tends to reduce crime rate. But school shootings are not regular crimes, they are acts of desperation. Clearly, the chart suggests a certain dynamic, where factors influence one another to produce a curve that looks like a trend, not just spikes like in 2007 and 2008. To me, this growth and this dynamic speak to complex interactions between multiple factors in play: the ease of getting fire arms, cultural markers (“copy-cat” tendencies), and difficulties confronting the future. This would suggest that curbing this dynamic (or complexity) will require a multi-pronged approach. The first is clearly gun control. How man shootings would have been prevented if guns were not readily available to their perpetrators? But will that be enough? The chart suggests to me otherwise. Focus has to be placed on the dynamic between the factors and how this trend can be broken. This entry was posted in Society and tagged availability, complex, complexity, dead, dynamic, fire arm, future, gun, incidence, incident, interactions, murder, news, school. shooting, society, trend, wounded. Bookmark the permalink. 2 Responses to What Causes School Shootings?